"Who do you think you are, Willie Nelson?!" Netflix has released the official trailer for a new stoner, teen comedy titled Dude, from writer/director Olivia Milch. This actually looks like the perfect 4/20 movie to watch this year, and of course Netflix is obviously releasing this on 4/20. 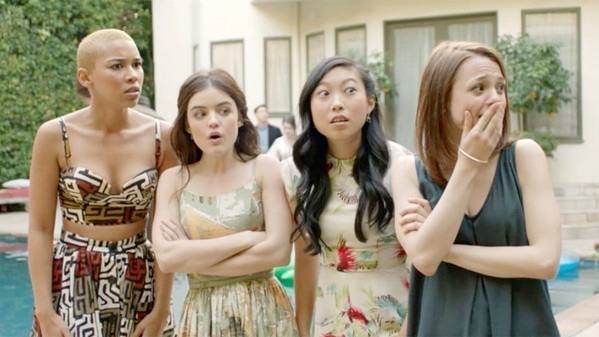 Dude stars Lucy Hale, Kathryn Prescott, Alexandra Shipp, and Awkwafina as four friends in the last two weeks of high school, who bond over relationships, smoking weed, and living their best lives. The cast includes Alex Wolff, Austin Abrams, and Michaela Watkins. It's an honest comedy about dealing with the first real losses in life, but it's also about getting stoned with your friends in your car listening to hip-hop. And it looks like a good time. Riding the highs of high school, four friends bond over relationships, drugs, and living their best lives. Four best friends navigate loss and major life changes -- and smoke a lot of weed -- during their last two weeks of high school. Dude is directed by up-and-coming American filmmaker Olivia Milch, making her feature directorial debut and working as a screenwriter - writing the scripts for Ocean's 8 and Queen & Country. The screenplay for this is also written by Olivia Milch, from a story by Kendall McKinnon. This hasn't premiered at any film festivals as far as we know. Netflix will release Olivia Milch's Dude streaming exclusively starting April 20th (of course) later this month. Your thoughts? Who really wants to see this?